Paul Arthurs served a long apprenticeship under Michelin-starred chefs including Michael Deane and Robbie shanks before setting up his own Paul Arthurs in Kircubbin. This restaurant is a hidden gem of the peninsula but with the help of Ardnet Online Solutions Paul is going to let out the secret of this wonderful restaurant. Arthurs’ have both a Restaurant, Bistro and Bar on Kircubbin’s main street serving breakfast, lunch and dinner as well as catering for private parties and providing a sunday carvery. The premises also boasts six ensuite bedrooms, an ideal location for anyone visiting the numerous golf courses on the peninsula or the Kirkistown racing circuit. 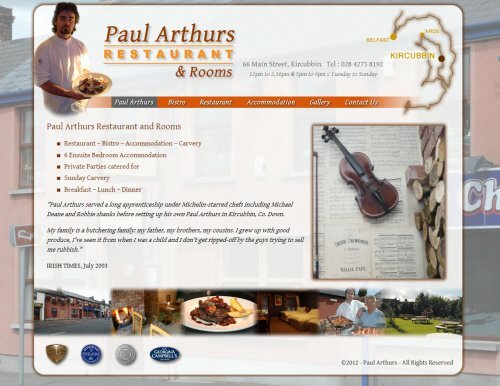 Our brief was to design a website that had both a contemporary looks and feel mixed with traditional tones, so we developed the new website www.arthurskircubbin.com to provide information on the Restaurant, Bistro, Accommodation and location information as well as a great photograph gallery feature. We really enjoy working with local companies in the North Down and Ards area, we are from this area ourselves so feel we have a vested interest in seeing local companies succeed.